Mr. Owl sells doughnut holes, and a few doughnut holes go missing every day. He takes a clever fox's advice and sells the doughnut holes in bundles of five and ten. Can he stop the doughnut holes from going missing and find out the mystery? Ji-hyeon Kim’s ‘Mr. Owl’s Bakery’ is part of the world’s largest mathematical story picture book series, called TanTan Math Story (70+ titles). The English translation of this original South Korean version was done in 2016. 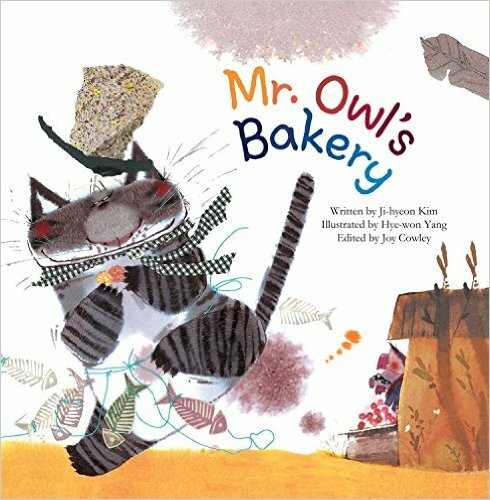 The story is about Mr. Owl who prepares 50 cinnamon doughnut holes and 100 sugar doughnut holes to sell everyday. When only four cinnamon doughnut holes and nine sugar doughnut holes start to remain at the end of each of his business days, Mr. Owl knows something is not right as the former are normally sold in bags of five and the former in bags of ten. A cunning fox turns up and advises Mr. Owl to put the two types of doughnut holes onto a skewer so that they would be hard to be stolen. Later that night, Mr. Owl follows the fox’s advice and put five cinnamon doughnut holes on each skewer, and ten sugar doughnut holes on each skewer. Whether this advice works can be found at the end of the story. The story itself is quite humorous with a moral message, but opportunities to learn and practise skip counting (i.e. the mathematical focus of the story) seems somewhat limited. Like most titles in this series, the book comes with a few mathematical word problems relating to the story to be solved at the end of the story. All in all, ‘Mr. Owl’s Bakery’ could be used to introduce the concept of skip counting to children aged 5+ years old.